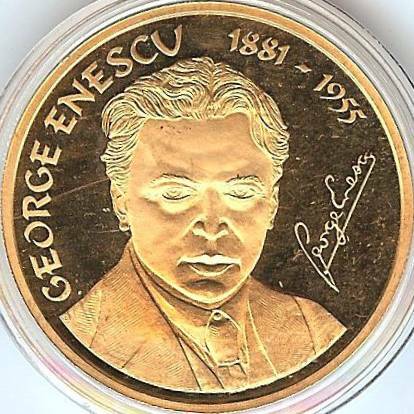 He was born in the commune Livezi - today George Enescu - in the Botoşani county. He was a composer, conductor, virtuoso violinist and pianist, and also a member of the Romanian Academy. George Enescu composed a number of rhapsodies, symphonies, sonatas for violin and for piano, other orchestral works and the opera Oedipe. The virtuoso violinist Yehudi Menuhin studied the violin (at Paris) with Georges Enesco. 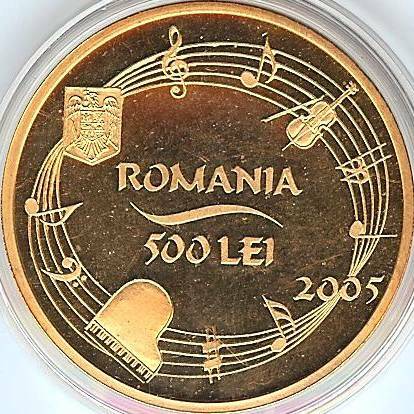 At the right of the Romanian coat of arms is a treble or G clef, then a sol (eighth note), a violin with a stick, a sign uncertain to us - maybe a double flat - and a mi (quarter note). Below the coat of arms is a mi (eighth note), a bass - or F - clef, a piano, a sharp and another sol (sixteenth note - stem, with two flags to the right). The coin pictures above are present on Romanian coins through the kind permission of Mr. Florin L.. This is the first commemorative coin struck after the leu denominalization, having 500 lei RON face value (5 millions old lei - ROL). The old gold commemorative coins having the same dimensions had 5000 (old) lei face value. 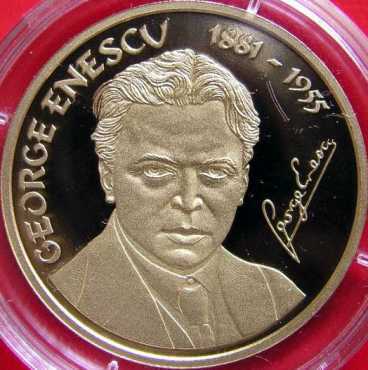 George Enescu is not the only Romanian musician commemorated through coin issues. 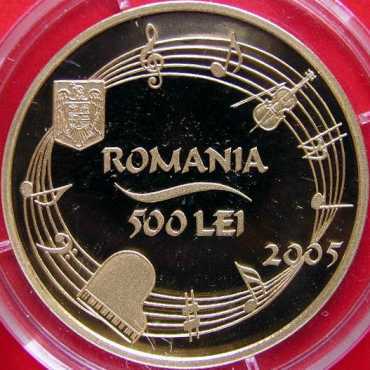 In 2003 a silver 500 de lei coin was struck for the 150th anniversary of the birth of Ciprian Porumbescu, a Romanian composer. Below are presented - through the kind permission of Mr. Alan Glasser - the pictures of a tombac essay for 500 lei 2005 George Enescu.